Recognized in more than 55 countries for its timeless and prestigious quality kitchens, the German kitchen and interior design company LEICHT Küchen AG selected Fives and its French subsidiary Fives Cinetic as part of the construction of its new 40,000 m² factory located in Schwäbisch-Gmünd in the Baden Württemberg region of Germany. 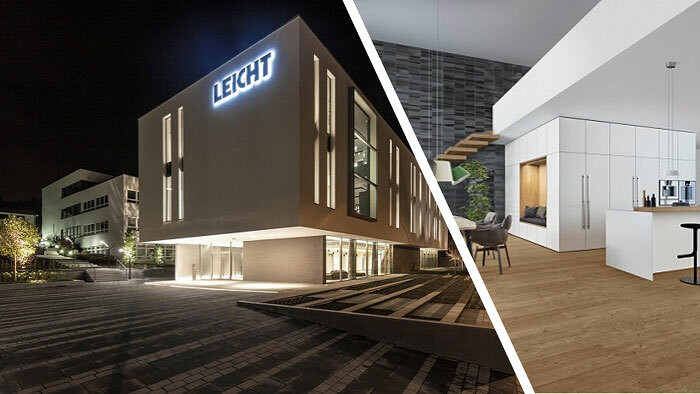 LEICHT is by far the leading German premium brand and sets standards in batch size 1 production. “The very high level of vertical integration and material diversity, in conjunction with an SAP-based corporate management system, allows an extraordinary variety of variants. The Cinetic SmartSorter system from Fives will generate groundbreaking efficiency benefits here” underline Stefan Waldenmaier, Leicht President. LEICHT Küchen AG has entrusted Fives with the creation of a 3,000 slots robotic sorter for high-speed sorting of the 13,500 daily panels constituting the whole of a custom furniture box. Fives will also deliver robotic cells for automatic feeding of the 2 main furniture assembly lines. These installations, now a flagship in Fives' furniture manufacturing solutions, are implanted between the edgebanding machine and the furniture assembly line. The system selected by LEICHT consists of a total of 13 multi-articulated robots and 2 gantry robots, necessary for the sorting, loading and unloading of all the panels in a mobile rack. With this first order from the largest European market for kitchen manufacturing, Fives confirms its ability to offer innovative solutions for customers looking for a very strong customization of their products. The Cinetic SmartSorter sorting system is a unique and patented concept with unrivaled performance on the market. Fives delivered sucessfully the handling, storage and sorting equipment for major French furniture manufacturers.